the happygirl: charming things: the best smelling t-shirts. ever. charming things: the best smelling t-shirts. ever. I just came back from my morning run and as I was running in my neighborhood I kept smelling clean laundry. I thought maybe the crisp 60 degree sunny weather was allowing the dryer vent scent to drift to the sidewalk. But as I ran past the garbage bins (Tuesday is collection day in my neighborhood) I realized that I should be smelling garbage and not clean laundry. This is a product I will be using with every load of wash we do. 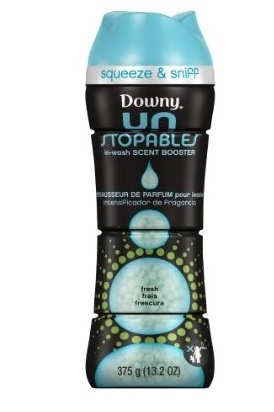 You can vary the amount of scent you add by varying the level of fragrance beads you add to your wash. Downy Unstopables are available in Fresh Scent (think clean laundry hung out to dry in the sun) and Lush scent (strong floral). This product is HE, color and fabric safe. Did I run longer because my t-shirt smelled so good? Maybe! This is a definite Happy Thing.